Humanitarian disarmament activists have been following the site for weeks now as all-male panels persist. Daily side event briefings held at this month’s Review Conference of the Nuclear Non-Proliferation Treaty (NPT) in New York provide ample evidence that all-male panels still thrive in 21st Century disarmament diplomacy. The Tumblr is just the latest in a long history of innovative efforts using the tool of stigmatization to end a bad practice and thereby help address a greater injustice. The term “manpanels” is not new either, but assumed currency after it was adopted by women from the Campaign to Stop Killer Robots and civil society at a meeting in Geneva one year ago in May 2014. They met at the end of a long day of deliberations at the Convention on Conventional Weapons (CCW) on “lethal autonomous weapons systems.” They were at the first multilateral meeting on the topic to urge nations to preemptively ban the weapons to ensure that targeting and attack decisions are kept under meaningful human control. But an obstacle stood in the way: No female experts were down to address the CCW meeting. France as chair had apparently invited female experts, but “no suitable women” were available. So the provisional agenda featured an all-male line-up of 17 experts over its four-days of sessions examining technical, legal, operational, and ethical questions relating to the emerging technology of killer robots. Prior to the meeting, Ambassador Jean-Hugues Simon-Michel of France acknowledged the lack of female presenters in correspondence with the campaign coordinator and highlighted the role played by female ambassadors from Mali and Sierra Leone as “friends of the chair” in facilitating two of the meeting’s sessions. The campaign noted the lack of gender balance in its media materials and worked to ensure its coalition “walked the talk” in featuring the women in its own delegation at side events, media outreach, delegation meetings, plenary statements, and in other activities. But that was just the beginning. Until that point in the campaign’s brief one-year history, gender diversity had been handled largely through back-door channels by the coordinator and campaigners raising it directly and privately with representatives of the events or publications concerned. A quiet chat followed by a friendly email would sometimes pay dividends in ensuring the inclusion of women. Norway noticed the campaign’s concern and acknowledged the lack of women at the 2014 CCW meeting, while Croatia urged greater gender diversity at the next meeting. Yet the problem at the CCW was months in the making and indicative of a near-complete lack of women in the emerging process, other than members of the Campaign to Stop Killer Robots and its allies. All the meetings and initiatives convened in the five-month period on autonomous weapons leading-up to the 2014 CCW experts meeting failed to achieve a gender balance in terms of panel speakers and facilitators except one: the first Chatham House conference on autonomous weapons held in February 2014. Key publications and media coverage were similarly dismal in providing women’s voices on the matter. Nobel Peace Laureate Jody Williams of the Nobel Women’s Initiative led the charge, drawing attention to the problem in her remarks to the CCW meeting, as well as in an interview with VICE Motherboard and piece in Foreign Policy. One media outlet reflected that, “the debate over killer robots is guy thing.” On the Just Security blog, Sarah Knuckey published a list of women experts available to speak on autonomous weapons systems, while participants including Charli Carpenter, Matthew Bolton, and Heather Roff published related pieces. Campaign co-founder Article 36 launched a pledge that more than 50 men working in peace and security–particularly disarmament, arms control and the protection of civilians–have signed committing not to accept invitations to participate on all-male panels. It has created a “Say NO to #ManPanels” website to house the list. Campaign representatives met twice with UN High Representative for Disarmament Affairs Angela Kane to discuss how to ensure women are included at the CCW and in other UN fora and institutions. 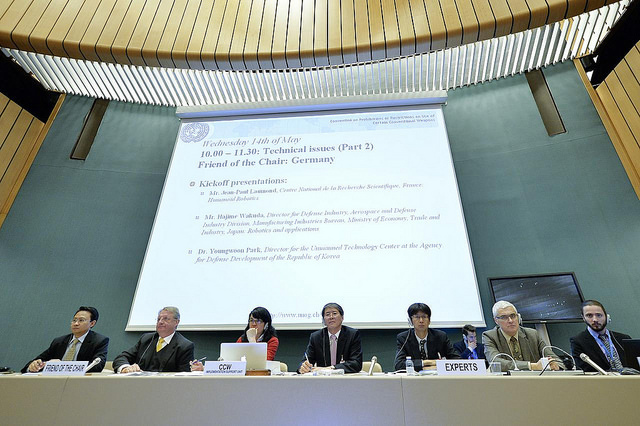 And while it can never constitute an “end” result, significant progress was evident at the second CCW experts meeting on killer robots held last month at the UN in Geneva. This time, women accounted for a third of the 30 expert speaking slots with strong presentations by Sybille Bauer, Maya Brehm, Monika Chansoria, Bonnie Docherty, Sarah Knuckey, Elizabeth Quintana, Kathleen Lawand, Caitríona McLeish, Heather Roff, and Karolina Zawieska. The opening session featured an all-male panel, but women spoke in every session after that. The diversity in the friends of the chair also continued on from the 2014 meeting, with female ambassadors from Albania, Chile, Hungary, and Sierra Leone each chairing a session. It remains to be seen if the CCW has changed its ways and embarked on a path towards greater gender equality in its deliberations let alone whether change can be achieved across other traditional UN disarmament processes. Separate CCW meetings held the week before the 2015 killer robots meeting saw no women experts speak to the meeting on landmines or explosive remnants of war plus an all-male side event panel on improvised explosive devices. The panelists have received their “Hoffsome” award.